As usual the EVN Newsletter updates information on recent EVN organizational changes, technological progress and the most important the scientific achievements. On behalf of EVN CBD I'd like to give some details on later decisions taken by EVN Directors. As you know the volcano ash cloud disrupted air communication and in fact made impossible to organize regular CBD Meeting, this time planned to be at Torun. As the functioning of EVN should not be affected the CBD organized for the first time (and I hope the only one) the teleconference instead. The next CBD will be hosted by the IAA at St. Petersburg on beginning of October. The Russian Kvazar network was incorporated into EVN in November 2009 and since provides stream of good quality, valuable data. Visiting our partner there will help to improve and to expand our fruitful co-operation. There are changes in EVN PC, an new at large member was selected and appointed - Prof. Nektarios Vlahakis a specialist on theory of AGNs. The CBD made a decision to simplify ToO procedures, it should make it easier and quicker to get observing time. The Board made decision to cease activity within the GVWG (Global VLBI Working Group) and bring an issue to the close. This body which was created ~30 years ago lost its power and significance for the community. All the EVN services function normally. We notice steady progress in Network operation, the technical development and scientific results. Recent highlights in these areas are presented in the letter. I'd like to draw you attention specially to interesting results on gas kinematics in high mass stars forming areas derived on methanol maser sources and on first EVN results for PSRJ2032+4127 processed at Bonn DiFX software correlator. With great interest we read about progress at Yebes 40m telescope. The installation of new 96 GHz receiver and VLBI fringes between Yebes, Onsala and Metsahovi show growing potential to perform high frequency observations within EVN. These and many other worth reading news are presented in the letter. The EC funded RadioNet program has been of great success for FP6 and it continuous to be so for FP7. A large support goes to EVN via Trans National Access and Network Activities funds, some throughout Joint Reserach Activities. Significant development of new technologies within the program makes us stronger in the global competition. Multi beam radio cameras, advanced digital technologies, mm and sub-mm arrays developments pave the way towards future investments. At the recent RadioNet Meeting on Sardinia the new Chairman (Prof. Franco Mantovani) and V-ce Chair (Prof. Rafael Bachiller) were appointed by the Board. I'd like to congratulate them and wish success with the completion of all tasks in this important international activity. Being in Sardinia we had a chance to visit a site, where an impressive investment work is conducted. The 64m SRT is now being assembled and as we heard the telescope will be able to start basic operation in the next year. Andrzej Kus, Chairman of the EVN Board of Directors. with the ONLINE PROPOSAL SUBMISSION tool Northstar. Observing proposals are invited for the EVN, a VLBI network of radio telescopes spread throughout Europe and beyond, operated by an international Consortium of institutes (http://www.evlbi.org/). The observations may be conducted with disk recording (standard EVN) or in real-time (e-VLBI). The EVN is open to all astronomers. Use of the Network by astronomers not specialized in the VLBI technique is encouraged. The Joint Institute for VLBI in Europe (JIVE) can provide support and advice on project preparation, scheduling, correlation and analysis. See EVN User Support at http://www.jive.nl. Proposals received by 1 June 2010 will be considered for scheduling in Session 3, 2010 or later. Finalisation of the planned observing wavelengths will depend on proposal pressure. e-VLBI proposals submitted by the June 1st deadline will be considered for scheduling in the above sessions starting from September 2010. Please consult the e-EVN web page at http://www.evlbi.org/evlbi/ e-vlbi_status.html to check for possible updates and for the available array. Note that only one wavelength will be run in each session, depending on proposal priorities. See http://www.ira.inaf.it/evn_doc/guidelines.html for details concerning the e-VLBI observation classes and the observing modes. The Institute of Applied Astronomy, Russian Academy of Sciences, St. Petersburg, joined the EVN in November 2009. The 32m radio telescopes of its KVAZAR network at Svetloe (Sv), Zelenchukskaya (Zc) and Badary (Bd) are made available for EVN observing sessions. Proposers may request these telescopes in EVN proposals for observations at 18cm, 6cm and 3.6/13cm. The two antennas at Shanghai (Sh) and Urumqi (Ur) may not be available in Session 3, 2010. EVN is now accepting proposals including pulsar gating/binning. Please consult http://www.ira.inaf.it/evn_doc/guidelines.html for details. The hardware VLBA correlator has been replaced by a software (DiFX) correlator. Processing of all scientific observations in Socorro uses this correlator. Mk5B playback is now supported (http://www.ira.inaf.it/evn_doc/guidelines.html). Please consult http://www.evlbi.org/evlbi/e-vlbi_status.html for the current e-VLBI array and for the availability of different stations per observing band and for the dates of the e-VLBI observing sessions. Due to e-MERLIN construction only an incomplete MERLIN array may be available in 2010 due to limited resources. For updated information please consult the web at http://www.e-merlin.ac.uk/vlbi Note that EVN+MERLIN projects will be considered only for separate EVN and MERLIN observing when eMERLIN is completed. Most proposals request 12-48 hrs observing time. The EVN Program Committee (PC) also encourages larger projects (>48 hrs); these will be subject to more detailed scrutiny, and the EVN PC may, in some cases, attach conditions on the release of the data. All EVN, Global and e-VLBI proposals (except ToO proposals) must be submitted using the on-line proposal submission tool Northstar. Global proposals will be forwarded to NRAO automatically and do not need to be submitted to NRAO separately. New proposers should register at http://proposal.jive.nl The SCIENTIFIC JUSTIFICATION MUST BE LIMITED to 2 pages in length. Up to 2 additional pages with diagrams may be included. The deadline for submission is 23:59:59 UTC on 1 June 2010. The EVN User Guide (http://www.evlbi.org/user_guide/user_guide.html) describes the network and provides general information on its capabilities. The On-line VLBI catalogue (http://db.ira.inaf.it/evn/) lists sources observed by the EVN and Global VLBI. Aims:To study the high-mass star-forming process, we started a large project to unveil the gas kinematics close to young stellar objects (YSOs) through the Very Long Baseline Interferometry (VLBI) of maser associations. By comparing the high spatial resolution maser data that traces the inner kinematics of the (proto)stellar cocoon with interferometric thermal data that traces the large-scale environment of the hot molecular core (HMC) harboring the (proto)stars, we can investigate the nature and identify the sources of large-scale motions. 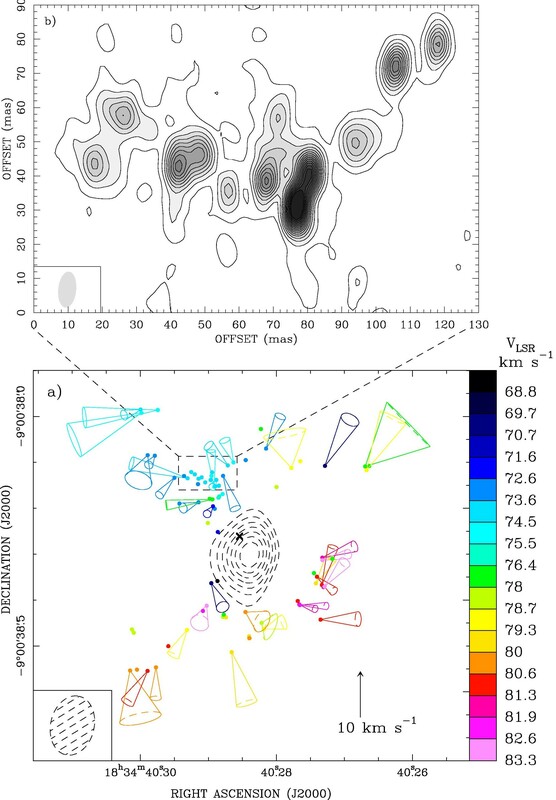 Methods: Using the VLBA and the EVN arrays, we conducted multi-epoch phase-referenced observations of the three most powerful maser species in both the G16.59-0.05 and G23.01-0.41 regions: water at 22.2 GHz, methanol at 6.7 GHz, and hydroxyl at 1.665 GHz. In addition, we performed high-resolution, high-sensitivity VLA observations of the radio continuum emission from the HMCs at 1.3 and 3.6 cm. EVN results:In the present work, we have collected evidence that methanol masers, such as water maser emission, are suitable tracers of the kinematics around massive YSOs. With three EVN epochs over a time baseline of 2 yr, for the FIRST time we measured accurate (relative errors < 30%) internal proper motions of the 6.7 GHz masers. The bipolar distribution of 6.7 GHz maser line-of-sight velocities and the regular pattern of observed proper motions suggest that these masers are tracing rotation and a composition of slow motions of radial expansion and rotation about the massive YSOs in G16.59-0.05 and G23.01-0.41, respectively. More details about the spatial association of the maser species, their overall kinematics, and a comprehensive picture of the phenomena observed in the two high-mass star-forming regions are discussed in the following papers:http://arxiv.org/abs/1004.2479 and http://arxiv.org/abs/1004.5578. Fig.1: 6.7 GHz CH3OH maser kinematics toward G23.01-0.41. a) absolute positions (dots) and transverse velocities of the CH3OH maser features relative to the center of motion of the methanol maser distribution (indicated by the cross). Colored cones are used to show both the direction and the uncertainty (cone aperture) of the proper motion of maser features. The proper motion amplitude scale is given by the black arrow on the bottom right corner of the panel. Different colors are used to indicate the maser LSR velocities, according to the color scale on the right-hand side of the plot, with green denoting the systemic velocity of the HMC. Dashed contours show the VLA 1.3 cm continuum emission. b) Contour plot of the crowdest region of 6.7 GHz maser emission. On 2009 October 23rd the EVN observed the binary black hole candidate SDSS J1536+0441. This is a very peculiar object showing two radio components detected by the VLA at 8.5 GHz within 1 arcsec and associated to two optical counterparts with multiple broad line components in the optical spectrum. The optical spetrum features seem to be associated to only one of the objects ruling out the possibility of superposition to explain the multiple components and it has been interpreted as a binary black hole candidate. The EVN observations were carried out at 5 GHz with 1024 Mbit/s sustained bit rate to exploit the large bandwidth capabilities of the EVN. Both the objects were detected by the EVN pc-scale observations for the first time. A comparison with the VLA 8.5 GHz observations allowed to derive an estimate of the radio spectra. Both objects show a flat or inverted spectrum and, in particular component named VLA-A, has an inverted spectral index (about -0.9 with Sν∼ν- α). Since the derived brightness temperature in VLA-A is too low for synchrotron self-absorption we suggested that thermal free-free emission provides the simplest explanation for the inverted radio spectrum. A paper based on these observations has been published on ApJ Letter (ApJ 2010, 714, L271). Fig.1: EVN grey-scale image at 5 GHz of the SDSS 1536+0441 field. The image has a resolution of 12 x 7 mas in PA 10 degree. 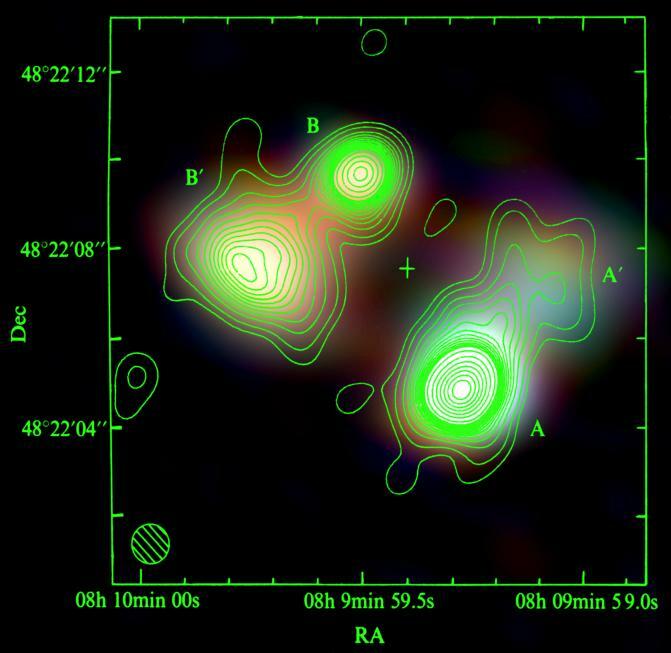 VLA-A on the right and VLA-B (on the left) are clearly detected with S/N of 50 and 15 respectively. Fig.2: Contour plots of components VLA-A (right) and VLA-B (left). The beam size is 12 x 7 mas in PA 10 degree. The 1sigma rms noise is about 0.015 mJy/beam and the peak brightness are 0.60 mJy/beam and 0.20 mJy/beam, respectively. The radio galaxy M87 (3C274, Virgo A) is one of the nearest Active Galactic Nuclei (AGN) and hence one of the most interesting for all astronomers. It is one of the few radio galaxies ever detected at TeV energies and an ideal target to look in order to constrain the place of high energy emission. In particular, both the bright compact core at the jet base (left panel in the image) and the so called HST-1 complex some 800 mas downstream the jet (right panel) have been proposed as possible candidates for the TeV production in recent years. A monitoring of this source with the eEVN has started a few months ago (PI M. Giroletti), at a frequency of 5 GHz, which offers the best compromise between sensitivity, angular resolution, and wide field of view. This monitoring has exploited the frequent observing windows offered by the eVLBI sessions, and it was carried out during the season in which TeV observations were possible. Indeed, on Feb 6th the source has been detected at TeV energies (ATel 2431), right after one of the epochs of our monitoring had been obtaind. Thanks to the prompt delivery of results permitted by real time correlation and pipelining at JIVE, we have immediately checked the status of the radio jet. No big anomalies have been found in either the core nor HST-1, showing that the action was yet to come (ATel 2437). A more recent TeV flare has also been reported (ATel 2542), and it has triggered X-ray observations and a target of opportunity request to extend the monitoring further. In addition to studying the connection to the high energy emission, the observations are allowing us to study the jet structure and kinematics with great detail. For example, a proper motion of components within HST-1 is clearly revealed from epoch to epoch, implying superluminal velocities. Pulsars have usually been discovered by performing blind searches at radio wavelengths. In some cases, pulsed emission above GeV energies has been detected, either by the MAGIC ground-based Cherenkov telescope or by the Fermi satellite. A blind search for pulsars with the Fermi satellite led to the discovery of the 143 ms period gamma-ray pulsar PSR J2032+4127, which falls in the region of the unidentified very-high-energy source TeV J2032+4130. 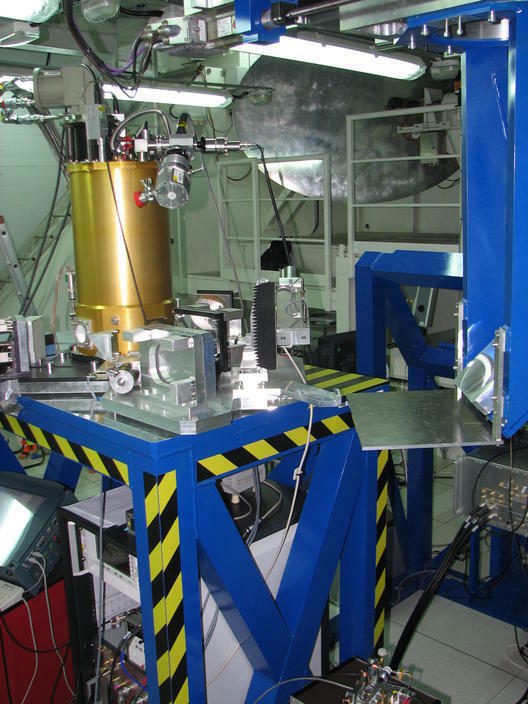 Subsequently the pulsar was also detected in the radio, using the Green Bank Telescope, with a period-averaged flux density of 0.12∓0.03 mJy at 2 GHz and 0.65∓0.13 mJy at 0.8 GHz (Camilo et al. 2009). The dispersion measure was found to be 114.8∓0.1 pc/cm3, corresponding to a distance of 3.6 kpc according to the Cordes & Lazio (2002) model. VLBI observations of radio pulsars can provide accurate proper motions, and in some cases parallaxes. In normal VLBI observations of radio pulsars one measures the period-averaged flux density along the integration time, although most of the time the pulsar is not emitting. The instantaneous flux density during the pulsation is usually tens of times higher than the period-averaged value, because the duty cycle (the ratio of the pulse width to the pulse period) is usually below 10%. To optimize VLBI observations of pulsars one can take advantage of this fact by only correlating the data during on-pulse, and disabling correlation during off-pulse. This technique is known as pulsar gating. The total correlated time is considerably reduced (a few minutes for every observed hour), increasing the final image noise by a factor proportional to one over the square root of the duty cycle. However, the signal increase is approximately proportional to one over the duty cycle. This provides a theoretical signal-to-noise ratio increase proportional to one over the square root of the duty cycle of the pulsar. Typically, the real signal-to-noise improves a factor between 2 and 6, which can make the difference between a non-detection and a clear detection, which leads to accurate astrometry. More sophisticated correlations can be used, as weighting the signal according to the pulse shape (matched filter). Until now it has not been possible to perform pulsar gating correlation of EVN data in Europe, and therefore it was difficult to combine the high sensitivity of this array with the enhancement of pulsar gating. Pulsar gating correlations can be naturally set in the new software DiFX correlators (Deller et al. 2007), and have been successfully performed in the VLBA and LBA correlators. For the EVN, the recently updated DiFX correlator in Bonn can now be used to correlate data using pulsar gating. This possibility will also be available soon at the new SFXC software EVN correlator at JIVE. 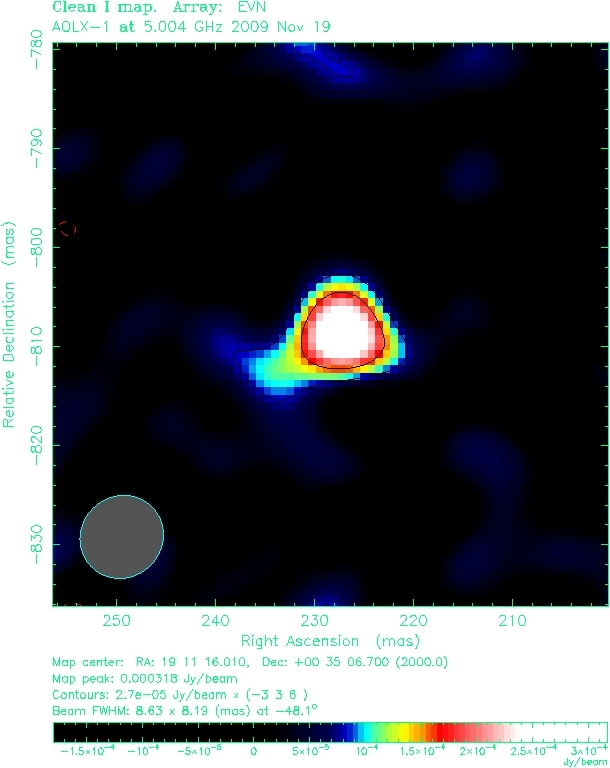 We observed the Fermi/GBT pulsar PSR J2032+4127 with the EVN at 1.6 GHz in March 2010. The source has a period-averaged flux density of 0.18 mJy and a duty cycle of approximately 10% at this frequency. To obtain a good position of the source, we observed it using phase referencing with 6 EVN antennas (Ef, Jb, Mc, On, Tr, and Wb) at 1 Gbps, and we correlated the data using pulsar gating in the new DiFX correlator in Bonn. The updated pulsar ephemerides needed to set the gates were obtained through regular pulsar observations made with the Lovell telescope at the Jodrell Bank Observatory. All the technical support required for correlating and checking the EVN data was provided by Walter Alef, David Graham, John Morgan, and Helge Rottmann (Max-Planck-Institut für Radioastronomie). A preliminary data reduction shows that the faint pulsar was detected with a signal-to-noise ratio of 8, with an improvement of a factor of 2 thanks to the use of pulsar gating. This has provided the first accurate VLBI position of this faint radio pulsar. Future EVN observations will allow us to obtain an accurate proper motion of PSR J2032+4127, which will shed light to the possible association of this pulsar with the unidentified very-high-energy gamma-ray source TeV J2032+4130. Fig.1: Preliminary images of PSR J2032+4127 obtained with 6 stations of the EVN at 1.6 GHz. The data were correlated with the new DiFX correlator in Bonn using pulsar gating, which improved the signal-to-noise ratio by a factor of 2. The left image corresponds to the data correlated during on-pulse (0.1 phase bin), and the right image during off-pulse (for a 0.1 phase bin as well). Aql X-1 is a recurrent transient X-ray binary system comprising a neutron star and a main sequence star. The compact object is accreting matter from the companion via an accretion disc. It is expected that matter is ejected from the system in the form of a relatively narrow outflow called jet. Aql X-1 exhibits outbursts about once a year, during which the X-ray and optical emissions are suddenly increasing and, the paradigm says, blobs of matter are launched in the interstellar space at near relativistic speeds forming a powerful jet. Generally speaking, the jets can be best observed at radio wavelengths. Unfortunately they are usually very faint, close to the sensitivity limits of radio facilities. Thus the outbursts offer some of the best opportunities to try to detect them. In November 2009, Aql X-1 has been very active again. A multi-wavelength campaign was set in motion, with observations at radio, optical and X-ray frequencies. The EVN observed the system at 5 GHz for about 4.5 h. The resulting radio map is shown. Although Aql X-1 has been detected at radio frequencies during previous outbursts, this is the first time when high-resolution (mas scale) images of the system have been captured. More interestingly, a marginally significant extended emission component is apparent towards south-east. This would imply a jet of size 10 mas (50 AU at 5 kpc). However, VLBA observations made on the same day at 8.4 GHz were consistent with an unresolved source. Simulations showed that a possible explanation for this is that the faint extended emission seen by the EVN is resolved out by the VLBA. Alternatively, the extension in the EVN image is an artifact. Two important results have been achieved at Yebes (Observatorio Astronómico Nacional) the second half of April. Both are related to the new 3 mm receiver installed at the 40 m radiotelescope. We hope that they are the first step for future results at this frequency with the 40 m antenna. The 3 mm receiver was installed at the 40 m telescope by the beginning of December 2009. The frontend was previously used at Plateu de Bure and belonged to IRAM. Its receiver temperature is approximately 70 K and its system temperature 200 K. It has got two linear polarized channels: at 1 and 3 mm. Circular polarization is achieved by inserting a teflon plate in front of the horn. The plate can easily be rotated 90 degrees. The 3 mm receiver IF and the control and monitor system were built at Yebes . The receiver uses a cold/hot load scheme to calibrate in amplitude. Switching between hot/cold and sky is done in less than 2 seconds by moving mirrors. The cold load is done by using a mirror which looks into the cryostat. On April 21st 2010, Yebes 40 m radiotelescope took part for the first time in a 2 hour fringe test at 86 GHz together with Onsala 20 m and Metsähovi 14 m telescopes. Data were recorded on the 3 telescopes in disk packs and later transfered to Bonn correlator. The data were extracted using fuseMark5, which allows to mount the disk packs as an external disk, and transferred later using tsunami. Fringes were found in the three baselines with SNRs from 50 to 110. Metsähovi recorded the data on two polarizations, while Yebes and Onsala only used one circular polarization. Since polarization sense was unknown at Yebes, 6 scans were recorded with the plate in front of the horn in a given position and 2 were recorded after the plate was rotated 90 degrees. 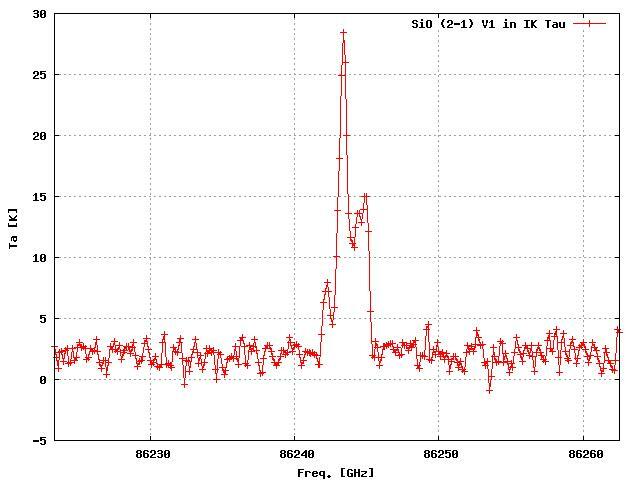 The week after the sucessful VLBI fringe test, the SiO 2-1 V1 line towards evolved star IK Tau and R Cas was detected using an autocorrelator of 2048 channels and a bandwidth of 256 MHz. The line was checked with a similar observation at Pico de Veleta. Figure 1 shows the line. Our next goal is to improve the efficiency of the antenna by adjusting the panels of the main reflector and by replacing the current membrane at the receiver cabin vertex. We expect that the eficciency may increase 4 times after these works. We wish to thank you the staff at Onsala, Metsähovi and at the Bonn Correlator (Dave Graham and Walter Alef) for their help during the fringe test and their work at the correlator. Fig.1: Spectra of the SiO 2-1 V1 line towards IK Tau. Fig.1: 3 mm receiver at the 40m cabin. The photograph shows the cryostat, mirror system (with the hot load) and the IF below the supporting structure. The members of NEXPReS (Novel EXplorations Pushing Robust e-VLBI Services) have completed contract negotiations and submitted all materials for final contract approval. The three year, follow-on project to EXPReS is expected to receive 3.5M EUR from the EC and to begin 1 July. The main goal of NEXPReS is to remove the current distinction between disk-based and electronic VLBI, creating a system in which all observations benefit from having a real-time component, while retaining the option to re-correlate the data at a later time with more telescopes and/or different correlation parameters. "Cloud Correlation" will develop high-speed (>1 Gbps) recording/transmitting capabilities for the full observation cycle, taking advantage of the higher observing bandwidths available to the EVN within the next few years and preparing the EVN for the higher operational data rates that will follow. "High Bandwidth on Demand" will encourage the adoption of dynamic networking technologies on a European and global scale, pushing the capabilities with e-VLBI and LOFAR applications. "Computing in a Shared Infrastructure" will create an automated, distributed correlator, developing the components of a real-time infrastructure that integrates network and computing resources. "Provisioning High-Bandwidth, High-Capacity Networked Storage on Demand" has two distinct aims with a common storage component. First, it will explore ways to implement on-demand, distributed, networked storage that can match the future multi-Gbps bandwidth and petabyte-class capacity requirements of VLBI. Second, it will address the use of such high-capacity storage systems for the data archives of the future, such as the SKA. The Square Kilometre Array project is the main global undertaking of the radio astronomy community for the XXI century. It involves massive technological developments in all areas of radio astronomy instrumentation. In particular, the SKA will require new methods of high rate data transport and processing. The EVN is conducting a development programme called e-EVN which aims at creating a VLBI network based on modern technologies including broad-band data transmission and real-time data processing. In response to the Call issued by the SKA Project in 2009, the EVN Consortium has submitted a proposal for recognising the e-EVN programme as an SKA Pathfinder. The programme is being funded by the participating institutes and, importantly, through external funding sources, such as the recently successfully completed EC FP6 project EXPReS and the new EC FP7 proposal NEXPReS (see more in the article by K. Yun in this issue of the EVN Newsletter). Science: The science case of the e-EVN development is focused at the centiarcsecond to sub-millarcsecond scale studies of faint radio sources at the frequency bands from 0.3 to 43 GHz, with a fast response time on targets of opportunity and near real-time availability of correlator output data for astronomical analysis. The science case of e-EVN is consistent and synergistic to several of the major SKA science drivers. Technology: The key element of the e-EVN programme is an introduction of the e-VLBI technique which enables real-time data transfer from remote radio telescopes to the central processing facility via optical fibre cables - as opposed to the "traditional" implementations of VLBI in which the data are first recorded at the telescopes on magnetic media (tapes or discs) and then physically delivered to the processor. Over the last four years, the fibre cable network link has been established to most of the EVN telescopes and, in some cases, to non-EVN VLBI stations at trans- and intercontinental distances. The data rate achieved so far reaches 1 Gbps per VLBI station. This value will increase in the next few years to 4 Gbps per station and to 16 Gbps/station in a 5-7 year perspective. Further developments will include data caching mechanisms aiming to increase the robustness of operations of distributed facilities, such as EVN and SKA, for both "raw" and "user" data streams. In parallel to establishing the network connectivity to EVN stations, the e-EVN programme includes relevant hardware and software upgrades of the EVN Data Processor at JIVE enabling this facility to correlate e-VLBI streams in real time. The Next Generation FPGA-based EVN Correlator currently being designed at JIVE will have real-time capability for the incoming data rates mentioned above as its main specification requirement. This effort is supplemented by the development of software VLBI correlators at several EVN institutes using clusters of powerful processors and distributed computing technologies. EVN institutes are also involved in the ongoing effort to develop VLBI user software capable, in particular, of handling large volumes of VLBI correlator output data in the most efficient way. This effort is being supported through the EC FP6 and FP7 RadioNet Joint Research Activities ALBUS and ALBiUS. Operations: Since the introduction of e-VLBI in the arsenal of operational modes of the EVN, the network as a whole and its institutes are developing operational practices that are required for scientifically efficient use of the large-scale real-time astronomical facility. The EVN has offered access to e-VLBI observations to the world-wide user community since 2006. The experience of the EVN e-VLBI operations is directly applicable to the SKA as an open large scale facility with real time transmission and processing of large amounts of data. All EVN institutes and most of its scientific and engineering personnel are involved in various SKA-related scientific, technological and other preparatory activities through a variety of links: direct contacts with the SKA Pproject Development Office, involvement in various EC funded projects (SKADS, PrepSKA), national and international SKA-related science and engineering projects (such as AAVP) and other means. These links will ensure a proper transfer of the expertise between the e-EVN programme to SKA Project. Recently the EVN CBD has been informed by the SKA Science and Engineering Committee (SSEC) that the status of a recognised SKA Pathfinder had been granted to the e-EVN programme. This is an important development which makes the SKA Project even closer to the daily life of the EVN community. Keeping in step with the rest of the world of VLBI, Arecibo is upgrading its VLBI instrumentation. Recent developments in digital data acquisition systems and disk recorders will allow Arecibo to record 1-GHz total bandwidth within its RF-frequency range of 1 - 10 GHz. This will employ a RDBE purchased from NRAO and a Mark5C recorder from Conduant Corp. The Mark5C recorder is already at Arecibo, with the necessary software under development at Haystack Observatory. We hope to bring the new system into service when the RDBE is delivered later this year. 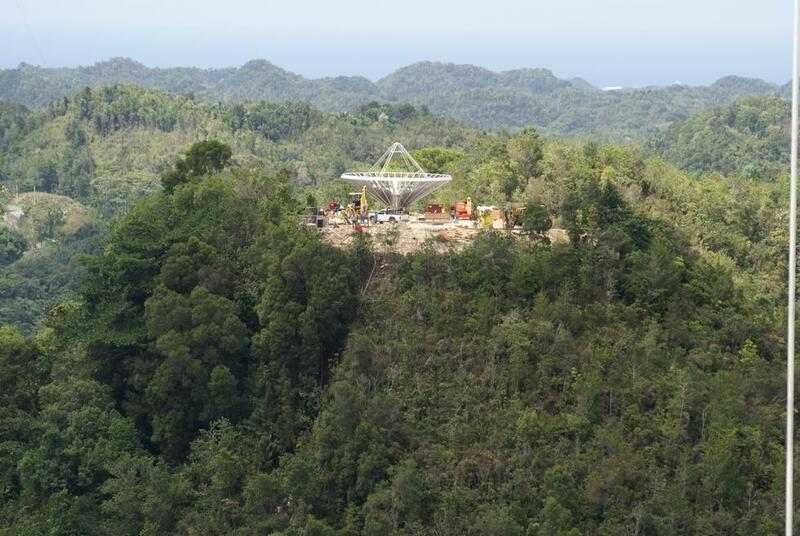 In addition, a Patriot 12-m antenna is under construction on the hill directly overlooking the Arecibo Observatory gatehouse. From there, the fully steerable 12-m dish will have a clear view of almost the whole "sky" down to an elevation of 5 degrees. The telescope surface is capable of supporting operations to well above the 10-GHz limit of the 305-m dish. However, for the foreseeable future it is planned to operate between 1 and 12 GHz. Initially, the dish will be equipped with a dual-frequency S/X feed purchased from Patriot, and a receiver system produced in-house. However, it is planned that a wide-band receiver system will later replace this, leaning on community design efforts for the VLBI2010 geodesy project, and the SKA and its precursors. The prime motive for investing considerable effort into this small telescope lies in the area of phase-referenced VLBI for astronomical imaging. The low slew rate of the 305-m telescope has meant that some of the potential sensitivity provided to VLBI imaging by the giant dish has been lost due to the time taken to slew between target and reference sources. In future, the small dish will track the (strong) reference source, so its "big brother" need only observe this occasionally. The phase derived from 12-m baselines with other telescopes will then be "copied over" to phase-correct the 305-m fringes to those same telescopes. A second RBDE and Mark5C pair will form the VLBI backend for this antenna. In addition to its usage as a 'Reference antenna" for the 305-m, the 12-m antenna itself could serve as a "stand-alone element" in any VLBI array. We note that the baseline to the St. Croix VLBA antenna would provide useful short spacing information, thereby improving both calibration and overall image quality. Further, the design of the fast-slewing Patriot dish makes it highly attractive for geodetic VLBI observations under the "umbrella" of VLBI2010. It will also be possible to route the signal from the small telescope to Arecibo's existing spectrometers, opening up possibilities for its use as a stand-alone telescope for either teaching or single-dish research. JIVE: It was agreed that the Mark4 DAS and associated spare parts, which are no longer used at the WSRT, will be given to the Kunming station in China. A status update on the Hartebeesthoek 26m antenna repair: The foundations of the temporary A-frame support structure have been cast and the necessary steel work is currently being fabricated, with on-site erection beginning in early June. If all goes according to plan we would hope to return to normal operations some time in August. This was again a full session lasting 21 days. Arecibo was scheduled for 4 observations but due to telescope structural failure could not take part. Robledo was scheduled for 6h for 1 observation. GBT was scheduled for 4 observations. VLBA was scheduled for 6 observations. The VLBA correlator was used for 3 observations, the Bonn (software) correlator for 2, and the EVN correlator at JIVE for the others. A UHF-band project planned for this session proved not to be technically feasible at Arecibo and was thus withdrawn. A total of 19 proposals (including 1 ToO) were scheduled, comprising 27 observations as follows: 18cm (10), 5cm (7), 6cm (8), 3.6cm (1), 3.6/13cm (1). The KVAZAR network telescopes Zc and Bd took part for the first time as full EVN members in the network monitoring runs at 18, 6 and 3.6/13 cm. The Shanghai telescope took part for the first time at 5cm. "projected 1Gbps(T-bytes Tb/tel)" indicates the quantity of data that would have been recorded if all suitable projects had been recorded at 1 Gbps. Eb: Azimuth track cracked December 21; fixed January 2010. Hh: "Estimated repair completion dates have moved out to August"
Ar: Feb 8: "major structural problem detected on the hanging platform, that has compromised the telescope tracking capability" Mar 24: "Arecibo telescope has now been partially released to operate within the ZA range of 6 - 10 degs. Zc,Bd: Mar 4: "Ftp data arrived for Ef, Nt, On, Wb, Mc, Tr, Jb, Cm, Kn, Sh, Zc, Bd. There were fringes to all stations but Cm. Please note here that the QUASAR Russian stations Bd and Zc participated for the first time in the EVN fringe tests"
Sv: Apr 7: "can't tell you exactly if Svetloe will be ready or not for 2nd EVN Session." Nt: Apr 6: "the Noto 32m radio telescope has experienced about a week ago a major failure of a bearing in one engine of the azimuth wheel" "participation of Noto to the May/June session seems difficult at present, since in any case the repair is likely long." Sh: Mar 5: "This is to let you know that we have successfully installed the 6.7 GHz receiver at Sheshan 25m telescope. Then some single-dish testing observations of methanol lines showed that the system works, although some calibration work is still needed. As such, we think that we can join the 5cm EVN observations in this March session (at least) in its testing mode." Sh,Ur: Not available for Session III due to requirement for tracking new Chinese Lunar spacecraft. European e-VLBI at very low frequencies has recently produced the first maps with a resolution of 1-2 arcsec. The low-frequency array LOFAR currently consists of about two dozen stations in the Netherlands plus four in Germany. Of the latter, the ones in Effelsberg (near Bonn), Tautenburg (near Jena) and Unterweilenbach (near Munich) are already connected to the network and can be correlated with the others. Calibrating and imaging these long baselines is difficult because of significant clock offsets, ionospheric delays and differential Faraday rotation. In an observation of 3C196 in the low-band range (30-80 MHz) with five Dutch and three German stations, we now used fringe-fitting results to correct for the clock offsets. After simple automatic flagging and conversion from linear to circular polarisations (to avoid problems with differential Faraday rotation), the data were averaged in time and frequency to write out uvfits files that were then calibrated and imaged with AIPS and DIFMAP. In this process we defined the 195 kHz subbands as "IFs" which were self-calibrated independently but using a common model. The maps shown in Fig. 1 and 2 were produced with DIFMAP by fitting a number of Gaussian components with variable spectral index to the visibilities. Phases were self-calibrated on intervals of 9 sec, while only one global amplitude solution was allowed for each antenna. The structure of 3C196 is quite different from the almost symmetric double seen at high frequencies, but surprisingly consistent with 408 MHz MTRLI observations (see Fig. 2). As shown in Fig. 1, the long baselines are essential to show any structure of this source. The results confirm that LOFAR is able to produce high-resolution images even with a limited number of stations. The structures shown here rely on only six independent baselines. The huge fractional bandwidth helps to fill the uv plane. Additional stations are currently or soon constructed in Nancay (France), Chilbolton (England), Onsala (Sweden) and Juelich (Germany). The station in Potsdam (Germany) is still waiting for its network connection. With the high-band system, true subarcsec resolution observations will be possible routinely. on behalf of the German Long-Wavelength consortium GLOW and the long baselines working group. LOFAR is a project of ASTRON (Dwingeloo). The three contributing German stations are operated by the "Max-Planck-Institut fuer Radioastronomie" (Effelsberg), the "Thueringer Landessternwarte" (Tautenburg) and the "Max-Planck-Institut fuer Astrophysik" (Unterweilenbach). Efforts of many colleagues at the stations and at ASTRON were required to make this result possible. We particularly mention James Anderson (MPIfR), Annette Haas, Matthias Hoeft and Jochen Eisloeffel (TLS), Benedetta Ciardi (MPA), and George Heald and Antonis Polatidis (ASTRON). 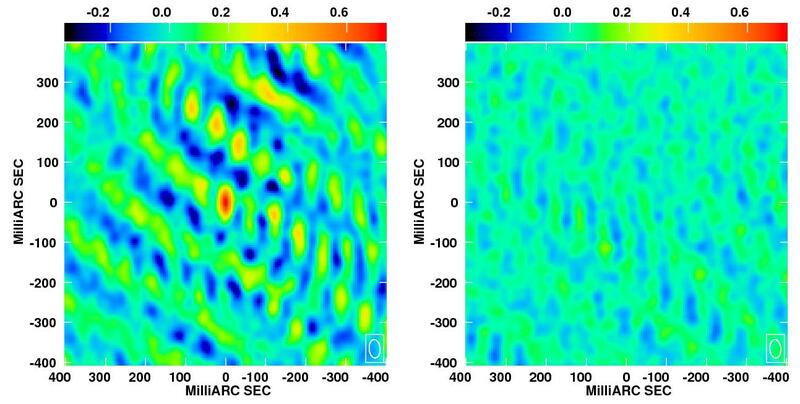 Fig.1: Maps of 3C196 from a 6h-LOFAR observation covering 30 MHz bandwidth between 30 and 80 MHz. The total flux of the source at these frequencies is about 140 Jy. Left: Using only five stations in the Netherlands. The resolution of 35x22 arcsec is not sufficient to resolve any details. Right: With the inclusion of long baselines, and approximately uniform weighting, the resolution is about 1.5x0.9, enough to resolve the four dominating components and even some structures within them. The colours are close to natural when red/green/blue are assigned to three bands between 30 and 80 MHz. Fig.2: Overlay of the long-baseline LOFAR map (restored with a circular beam of 1.5 arcsec and slightly exaggerated colours) with contours from earlier 408 MHz observations with the MTRLI (taken with permission from Lonsdale & Morison, 1980). Obviously the general structures seen by LOFAR and MTRLI are consistent with each other, even though the relative flux densities of the components differ significantly. EVN Newsletter No. 26. 2010 European VLBI Network. Edited by Magdalena Kunert-Bajraszewska (TCfA, Poland).